Digital music downloads are on a steep decline and music streaming services are rising in popularity. There are different streaming services available today and they let you pay a small fee every month, providing access to vast music libraries which you can listen to whenever and wherever you are. There are also free music streaming services,but you have to put up with ads which play in between the songs if you are up to the task. Different companies are offering these services and it can be a bit tricky to decide which one to use. While all of them offer streaming services, they differ in price, music libraries, subscriptions and many other things. Amazon Music Unlimited and Deezer are some of these music streaming services and in this article we try and see how different they are. This is one of the essential elements of a music streaming service and most of the time the service which dominates regarding music libraries is more dominant. Each of the two has millions of songs available to listen to each depending on the country the service is used. 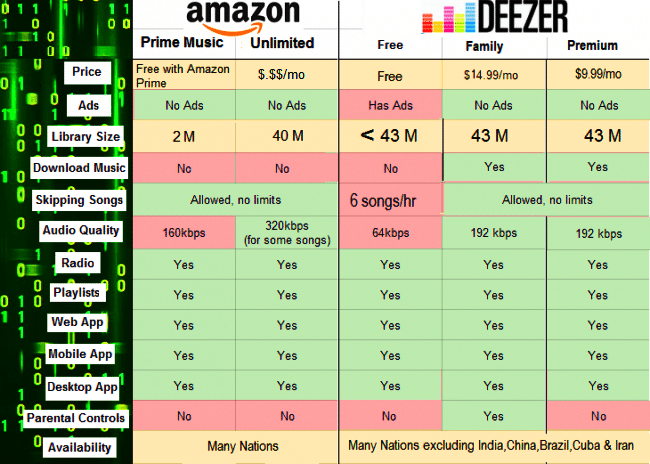 Deezer has 43 million songs that reach more than 180 countries and like said before, the number of songs available in different countries vary. This is one reason why there is a higher song count in Deezer’s library in other countries,but it is lower in the UK. Deezer also has extras for some artists offering live albums that Amazon Music Unlimited doesn’t have. With Amazon Music Unlimited, you get to access a more extensive library of 40 million songs. They are also adding songs regularly which means if there is a song missing from the library and you were hoping to listen to it, there are chances it will appear at some point. However, with the songs you have access to, you can add the one you like to your own playlist and favorites. Deezer has a light, clear and simple design in both the desktop/web versions and the mobile/tablet of the service. Deezer is easier to navigate as compared to other streaming services and Amazon Music Unlimited in particular. Amazon Music Unlimited has a different layout which is akin to the style of their sister service Amazon Prime Video service. What makes the app easier to navigate is the fact that there are not so many ways to discover and browse music which might not be a good thing if you look at it in another perspective. One advantage of using the mobile app of Amazon Music Unlimited is getting to use Alexa who is now baked in and she is no longer available only on Amazon’s Echo and Fire devices. This means with the mobile app and Alexa; you can tap a button and ask Alexa to play a specific album, song, genre or playlist. When it comes to music discovery, Deezer has a fantastic feature called ‘Hear This’ which is a music feed personalized for you. The feature shows you new tracks as well as albums from artists you have added to your favorites or the one you frequently listen to. It also picks songs based on the playlists created by users who have the same or similar music tastes to you and the listening habits of the user meaning you will never run out of songs to listen to. Amazon Music Unlimited, on the other hand, bases your recommendations on your reviews and purchase history on Amazon. And this is one place you might want to spend some time on especially if you purchase gifts for people who have different tastes to you. With over 40 million songs available, Amazon Music Unlimited also offers personalized content faster. They also have a functionality called “Similar Artists” which displays artists/albums that other users have listened to. Deezer has themed radio channels, artist radio channels and partner radio channels with lots of different genres to choose from. If you are using the free version of Deezer, you can get a limited amount of skips in the Radio feature. The artist channels intelligently pick songs from the artist you have selected and related or similar artists. Amazon also added a radio feature as of January 2016 and users can listen to ad-free songs based on an artist or genre. You also get the chance to give thumbs to the songs you like and thumbs down to anything you are not so keen on to improve personalization. Deezer has additional features like built-in lyrics where the user can see the lyrics when the selected song is playing. Another cool feature on Deezer is social integration with Facebook which allows you to see what your friends are listening to.